Saturday, September 26 marked the grand finale to KCTL's sixth tennis season: The Annual Youth Tennis Tournament & Community Jamboree. What a wonderful day we had! The courts at Marcy Playground welcomed students, volunteers, parents, and family members with perfect, sunny weather. Upbeat music pumped from the speakers as burgers, hot dogs, pasta salad and fruit were served. It was the perfect community party atmosphere and farewell to summer. The main event--the tennis tournament--featured dozens of gripping matches, positive sportsmanship, and commendable individual efforts. Regular matches were played on seven mini tennis courts simultaneously, while the Final Rounds for each bracket were held independently at the end of the day. In addition to the tournament bracket trophies, we presented a new award--Player of the Year--to a student who maintained perfect attendance this season and who always tried his best. This award went to Jovani A., who was also the 11 & Over Bracket's Runner-Up. As KCTL President & Founder Michael McCasland reminded us during the Awards Ceremony, there are very few winners in a tennis tournament. Because almost all participants leave the courts as losers, there's no reason for students to get angry at themselves--or at their opponents--because they didn't finish in first place. Instead, participants are encouraged to look to the winners for inspiration--to mimic their dedication and consistency--in order to learn and grow as tennis players and as individuals. With this in mind, we're immensely proud of every single one of our students. Congratulations to everyone who played with us this season! We look forward to returning to the courts together in 2016! You can view all the photos from the 2015 Jamboree on Facebook. Unfortunately, mother nature hit us with some lousy weather for our special end-of-season jamboree and youth tennis tournament, but that didn't stop us from having some fun and rewarding the kids for all their hard work this season! Special thank you to Jon W. and the Committee for planning and putting together the jamboree this year. The rain dampened the court, but not our spirit, it was a blast. View all the photos from this year's end-of-season meeting on Facebook. To celebrate a successful tennis season and all the handwork of our youth athletes and volunteers, KCTL holds a fun-filled day of youth tournaments and a community jamboree. The youth tournaments include an 11-and-over bracket and 10-and-under bracket that students from all four sites compete in. All players receive merit awards for participating in the season and the tournament. Tournament winners will receive trophies. The community jamboree includes free food, music and entertainment. The event starts at 1pm and goes until the tournament is over. And we'll have a very special, first ever, finals match from those playing in the competitive division of the KCTL's Volunteer Tennis Tournament! Saturday, October 4 at 1pm at Marcy Playground (corner of Myrtle and Nostrand Avenues) in Bedford-Stuyvesant. In case of rain, the event will happen on Oct. 11. Check out more photos from our 2013 Jamboree and 2012 Jamboree on Facebook. KCTL has had an amazing season this year and I can't believe it's almost over! Cheer on over 100 kids on Saturday as they participate in KCTL's Youth Tennis Tournaments (9 and under, 10 and over). Meet KCTL board members and volunteers, hang out with your BedStuy neighbors and enjoy a whole afternoon of tennis. There will be music and kids' games and food! View photos from last year's end of season tournament and jamboree on Facebook! Album 1 and Album 2. End of Season Jamboree: Congratulations Marcy Tennis Club! On Saturday, KCTL held it's 3rd annual end-of-season tournaments and community jamboree. It was a great day of tennis and community engagement. All four KCTL sites (Marcy, Tompkins, Lafayette Gardens and Sumner) registered tennis players in our tennis tournaments - one for kids nine and under, and the other for kids ten and up. 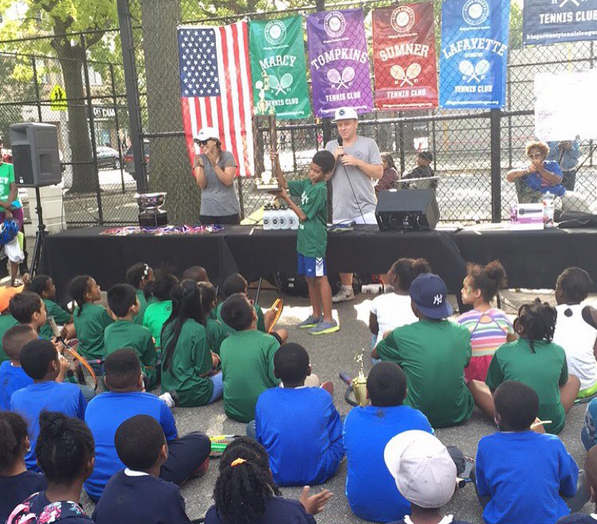 The tournament was played on eight youth-size tennis courts with the semis and final matches played on the tennis court at Marcy Playground. The tournament was preceded by lots of fun group photos as well as the playing of the national anthem. Amped music filled the playground all afternoon, and a clown/magician entertained the kids while they waited for their matches. Lunch was provided to our athletes, volunteers and community. Not surprisingly for a group of kids, icees were the most popular item on the menu. It was really fantastic to watch the kids play, and to meet the kids from other sites that I'm not personally involved at (I primarily volunteer at the Tompkins site.) The kids were friendly no matter what shirt they wore. I saw several moments of camaraderie when after winning a match, the winner consoled the losing player that they had played great, it was a good match and other kudos. My heart just about burst. It made me realize that these kids get it, that character is more important than competition. The 10 and up tournament came down to two boys from Sumner and Marcy. Marcy won. The 9 and under tournament came down to two boys from Marcy and Tompkins. Marcy won again. All in all it was a great day. I'm sad for the season to end, but I can't wait for it to start again in the spring! View all the photos from the jamboree on Facebook. End of Season Tennis Tournaments and Community Jamboree! The end-of-the-season jamboree and tennis tournament is upon us! On September 29, 2012 from noon - 4pm, join the community and KCTL for youth tennis tournaments, free food and live music. Participating students will win awards and trophies. Registration for the tournaments start at noon. Tournament play begins at 1pm. There will be a 9 and younger tournament and a 10 and older tournament. The rain date is Saturday, October 6. Come out for a great day celebrating the KCTL program and the Bed-Stuy community! RSVP on our Facebook page. End of 2011 Season: Tennis Tournaments and Community Jamboree! 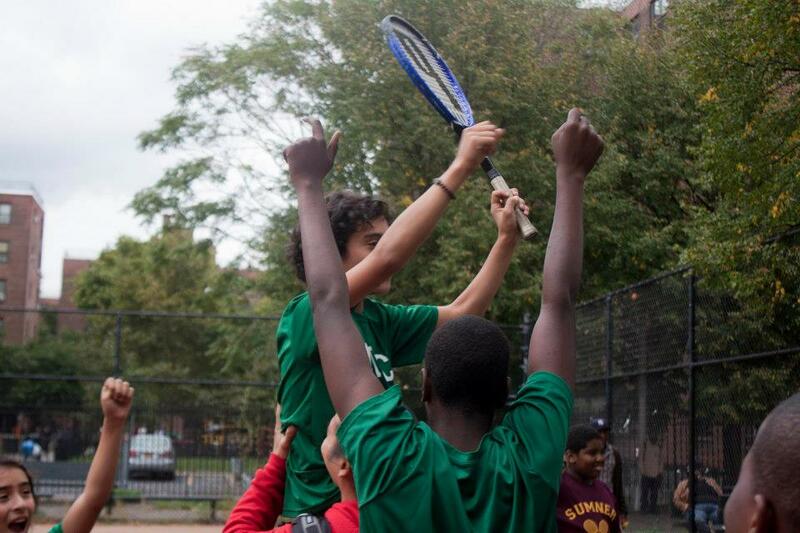 "The young members of the Marcy and Tompkins Tennis Club face off at second annual tennis jamboree."